Bob Shaw (guitar), Lloyd Nerland (guitar), Steve Pugsley (drums), and Joe Unzicker (guitar) were the four lads from Mitchell and Huron, SD who made up Jay-Bee and the Kats. Lloyd was cousin to Myron Floren and came from a musical family. By age fifteen he was teaching guitar lessons to people in the Huron area. Bob had been in a band with the same name so they continued going by Jay-Bee and the Kats. Joe was a left handed picker who had voic e training in opera but quickly switched to rock and roll. Starting in 1962, the band played in ballrooms, clubs, and dance halls all over South Dakota as well as Western Minnesota and North Dakota. They became extremely popular and many nights performed to over flow crowds. One of their favorite venues was Ruskin Park, located at Forestburg, SD. The following year Bob and Lloyd co-wrote what might be the greatest instrumental to ever come out of SD, "Tension". It was recorded at Kay Bank studios in the Twin Cities in the spring of 1963. The flip side was called "When School is Through" and featured Joe on vocals. The 45 was on the Bangar Label and initially there were 500 copies pressed with more later. "Tension" received airplay in different parts of the country and eventually got the attention of the Ventures, who planned on recording it for one of their albums, although they never did. The Kats felt that George Garrett of Bangar didn't do enough to promote the record. After the record was released the Kats popularity rose to an even height level and they were in demand all over the Upper Midwest. In 1965 Bob Shaw was drafted and the Kats broke up. Joe spent some time playing with the Mystics out of Aberdeen and Lloyd joined the Talismen for a short time before attending college in California. Joe eventually became a music teacher but soon returned to performing. 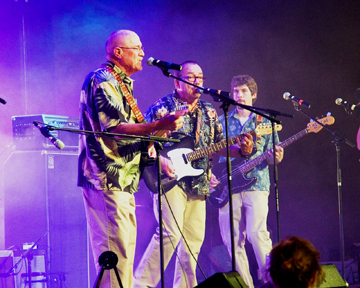 The Kats had a great run and will be remembered as one of the premier rock bands of the sixties in SD.